Today I want to answer a question that I've got millions of times. Why is synthetic oil so expensive? The answer, although simple, involves a few insider tricks of the industry to explain you why you pay $35 for a regular oil change but $80 or more for a synthetic oil change​. And I know you love some insider secrets. The most important difference between conventional and synthetic oils, are the additives. Typically, synthetic oils come with a pack of additives such as detergents, anti-wear agents like zinc dithiophosphates and many, many more. This additives help extend the operative life of the oil, increase its lubrication properties and provide with better results overall. On the other side, conventional oils tend to have a much lower amount of additives, as their base stock is typically from lower qualility (Group I or II) and it would be a waste of money to add expensive extras to a poor quality base product. If you remember the post where does synthetic oil come from, I explained the 5 different Groups in which base oils (or stock) are split. As I covered on that post, synthetic oils are also split between semi-synthetic and full synthetic, being full synthetic only those which used Group IV or V as base oil. Oils from Group I, II or III are mineral oils, conventional oils or regular oils (call them as you prefer) that come from, you know, good ole tyrannosaurus broth. Being therefore a lot cheaper than man-made, synthetic base oils. So now that it is clear that the base product is more expensive (synthetic vs dyno) and that the additives are also more expensive, let's see how the prices of conventional oil changes are artificially cheap​. So you may have seen those 29.99 Oil and Filter change at any major chain or franchise and thought "then why does my BMW dealership charge me some painful $97.45 for my oil change?" Well, here's why: Quick services don't truly make that much profit on oil changes. Your front pads really need to get changed and by the way, the tread on your back tires is already in the danger zone, you sure you want to have those tires for the winter? And there you go, get in for a $29.99 oil change, you walk out with new oil, new pads, new tires, new radio, new air freshner and a $184.79 bill to pay. With synthetic motor oil, however, the service is already a premium. They're already at profit. That's not their lure. So they charge you accordingly. If you use some of the best synthetic motor oils out there, you get a massive advantage in terms of duration of use. Meaning that even if you actually pay four times as much for an oil change (which is an absurd lot more than the reality), you still pay the same price per mile of use​. Not only that, but the much superior quality of the oil comes with a lot of long-term advantages that actually have a measurable impact: MPG. 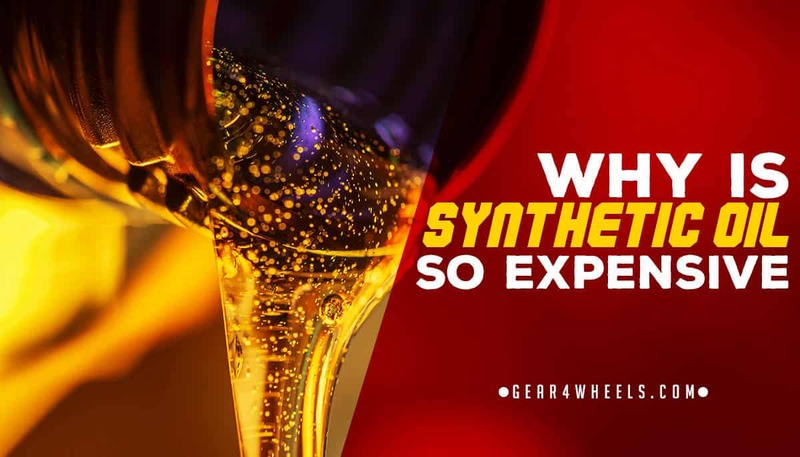 Most synthetic oil brands claim improved mileage vs conventional oil and in the majority of cases it is true (perhaps not as much as they claim, but totally true, specially perceivable in colder climates) so you actually also save money on gas. And then comes mechanical problems derivated of age, use and miles. The better lubrication that comes with synthetic oils reduces the number of lubrication-related problems in the engine, saving you also a good amount of money in repairs. ​When judging a product's cost, dont just look at the price tag. More often than not, we are misleaded by marketing, low prices and attractive offers to think that we are getting a good deal, but after you consider all the facts and variables such as use, duration, quality etc, you end up realizing that sometimes paying a little extra does actually save you money. I hope to have clarified why is synthetic oil so expensive with this article. As always, if you have any questions leave a comment below and I'll answer your doubts!